As a wise, fictional cockney once said, 'small pleasures - who would deny us these? ', and although there's probably inspiration enough in that scrap of Oliver!, it's not the one I've picked to use right now. 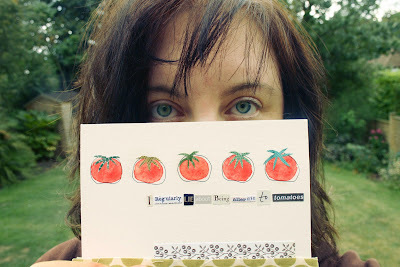 Instead, the small pleasure that's provided our latest prompt is Post Secret. If you don't know about this wonderful project, I'm not going to ask where you've been, just suggest you check out either the blog or one of the books, and prepare to be enthralled. The postcards which comprise the project - all submitted anonymously – are a nosy art-lover’s dream (yes – that’ll be me, on both counts). In turns jaw-dropping, wry, heart-rending and mysterious, they are somehow endlessly fascinating. 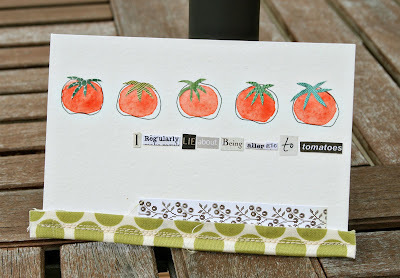 Seeing the Post Secret digest pop up in my blog-reader on a Sunday morning is most definitely one of the aforementioned small pleasures and the combination of words and pictures which make up the postcards seemed a perfect leaping-off point for a Copy+Paste challenge. For Julie and I, the big difference between our secrets and those shared on the original PS blog, is the lack of anonymity. It’s much trickier to bare your soul when people have some idea of who you are. For me, at least, it ruled out any kind of deep, dark secret (not that I have an especially murky or intriguing past) and steered me towards a more minor admission. In the spirit of Post Secret, I’m not about to explain the reasoning behind my vegetable-based shame (and yes, I know tomatoes are technically a fruit, but when was the last time you chopped one into a bowl of ice-cream?). All you need to know is that I genuinely squirm each time I do it, but have to accept that sometimes white lies make life simpler than the thorny truth. Firstly I need to say how much fun it was finding Kirsty's confession dangling from my letterbox yesterday. I'd love to know what our respective postmen/ women thought of our little revelations as they were delivering them. I hope it brought them a little light relief amidst the same old envelopes and junk mail. Like Kirsty said, finding the right level of secret to share was a tricky one. Especially as we didn't give each other any hints about what we were going to spill! Difficulties arose when certain secrets began to demand I reveal them - like they wanted to bask in the light of all your attention after years of being smothered in darkness. Was that a secret? Did you know? Could you have guessed? 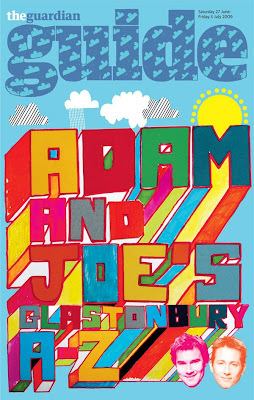 Seeing as how Adam and Joe make me laugh so very, very much I felt it fitted perfectly with the nature of my revelation. The original artwork is by 'Rupert' from the design collective: www.thisisrude.com and you can see a closer image of it here. [It's definitely worth a look if you like the feel of retro / 80s old school illustrations and doodling]. It's your turn now to struggle with your inner big-mouth who wants to tell all ... and the sensible you who has that fine, upstanding reputation to maintain! Good luck. So, now you know a little more about the two of us than you did at the start of this post, we’d love to take a nosy at your secrets, too. If you play along, remember to leave us a comment below or drop your images into the Flickr pool. We promise - hand on heart, pinky-swear and everything - that, however blush-worthy they are, we won't tell a soul. "Readers’ comments have prompted a flurry of giveaways on The Copy + Paste Project this week." Congratulations, lovely commenters! If you want to drop me an email with your contact info via the link on this page, I’ll get the cuff sent off to Anne, and Little Yellow to Sarah. Thanks so much to everyone else who entered and left such kind comments. There were also a couple of people who asked about the buttons on my yellow screensaver. You can find the set here (they make up part of a vintage kit from Kitschy Digitals) and, if you look closely, you’ll see they’re the same set used on the yellow glove, necklace and journal projects in the original yellow post. I’m planning to post a customise-your-desktop tutorial over on my blog in the next day or two, for anyone who’s not sure how it works (I’m no techno-genius, so it’ll be a pretty straightforward affair). 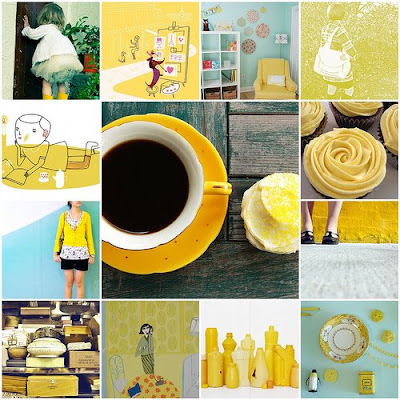 The yellow buttons, although super-cute, aren’t a pre-requisite – you can use clip-art or photographic images, as well as your favourite digital scrapbooking supplies (even the free ones!). So, I think that’s just about it from our little flurry of colour-themed excitement. Regularly scheduled Copy+Pasting will resume shortly. Although, no post being complete without at least one pretty picture, I think there’s maybe space for one, last yellow hurrah, courtesy of some Flickr favourites. if you prefer, and are a Flickr member, you can send me a Flickr mail via my 'nabview' account. Then sit back and await your delivery. I wish I had something for all of you as I hate leaving people out [I guess that's what years of being chosen last at school does for you!!]. The least I can do to thank you all for playing along is to point you toward another giveaway on Gauche Alchemy. This time it's a blue kit they're offering. I really love it. The colour is painful in it's loveliness, it's pure silk yet was a £25.00 bargain: it's as near to perfect as a dress can get! Plus, I almost made it my response to Kirsty's 'Six Impossible Things' prompt as, when I'm wearing it, I feel so very, very much like Alice Through the Looking Glass.